For many people, it's not the prezzies that are the highlight of Christmas Day but the Christmas dinner! Traditional festive fayre consists of a roast turkey dinner, stuffing, crispy roast potatoes, pigs in blankets and (of course!) sprouts, followed by a large helping of Christmas pud! However, things are a little different for me this year. About six months ago, I decided to become vegetarian and I haven't looked back! I've felt so much happier and healthier with a meat-free diet, and in January, I'll be taking on the Veganuary challenge. I'm not alone - the vegetarian and vegan movements are growing by the day. 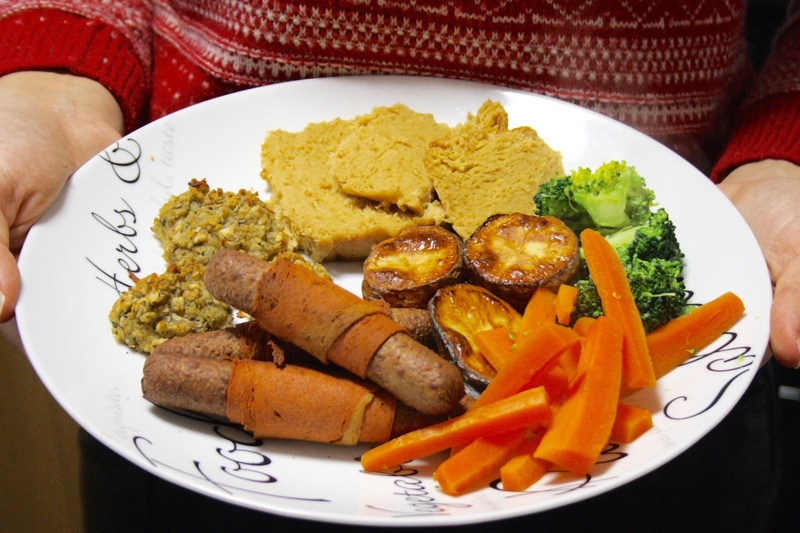 But that doesn't mean that the ever increasing army of veggies and vegans go hungry on Christmas Day, there are plenty of delicious options out there! 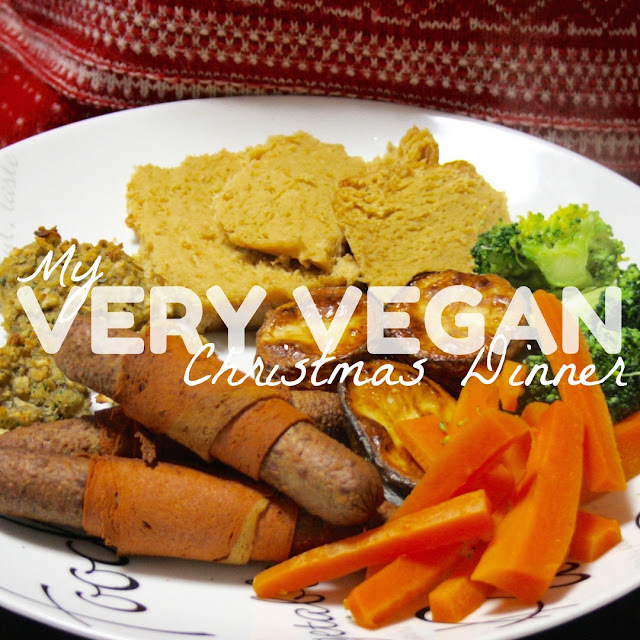 To prove this to any doubters, I decided to put together a delectable and 100% vegan Christmas meal that will satisfy even the most discerning tastebuds! Keep reading to discover my cruelty free Christmas! It may have been cheating not to cook this myself from scratch, but as I had quite a lot on my plate (LOL) with preparing the main course, I decided to make life easier and pick up some soup for the starter. 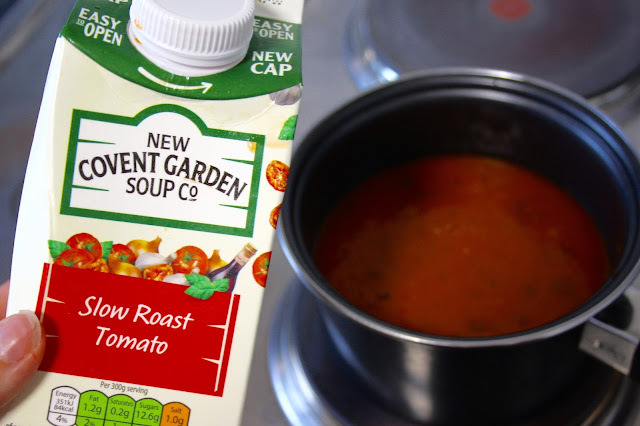 I love a good tinned soup and it made me sad to discover that my favourite cans from Heinz actually contain milk, so instead I picked up this Slow Roast Tomato soup from the New Covent Garden Soup Co. I got this for £1 from Asda as a rollback special and it was very tasty - perfectly seasoned and a real winter warmer! It is marked as vegetarian and not vegan, but I wasn't able to see anything on the ingredient list that would indicate that it isn't vegan friendly. For the main event, I decided to keep things traditional with a turkey-style roast. I hit up my local Holland and Barrett and purchased a VBites Cheatin' Meat-Free Turkey Roast for £4.89. Cooking it couldn't have been simpler, I just took it out of the packaging, wrapped it in foil and popped it into the oven for 50 minutes! There was a huge amount, way more than you could ever eat in one go, so I have been eating fake turkey sandwiches for several days now! I must admit that I didn't have high expectations for this roast (it doesn't look super appetizing when you first take it out of the packet) but it was a surprise highlight of the meal for me, it was moist and delicious! I wouldn't hesitate to buy it again. 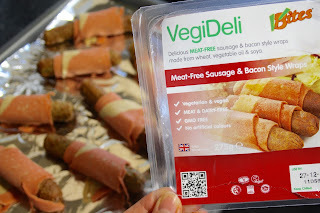 Also from Holland and Barrett came a pack of VegiDeli Pigs in Blankets! I had heard about these on Twitter so naturally had to try them out! They cost £3.69 for a pack of eight. I must say that I felt that the cooking instructions on the packet weren't the best - they recommended cooking the pigs in blankets for 30 mins but although I followed the instructions to a T, mine were a bit over-done. I would instead recommend cooking for 15-20 minutes to prevent the "bacon" on the outside from becoming charred and crispy. 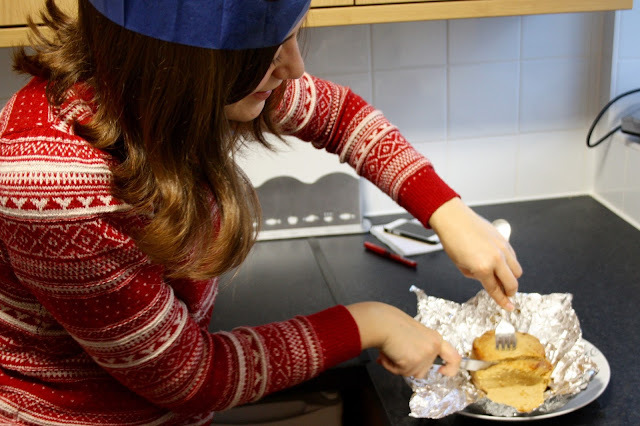 The rest of the main course was no different to a standard Christmas dinner - I simply cooked my roasties in oil instead of goose fat (an easy exchange to make), and made my own stuffing balls using Asda's value stuffing, costing just 19p. Again, this wasn't explicitly marked as vegan friendly but nothing on the ingredients list suggested that it was from animal origin. As I'm not the biggest sprout-lover, I chose to have brocolli and carrots as my vegetable accompaniment! It wouldn't be Christmas without some sweet treats, and it was so easy to find vegan options! 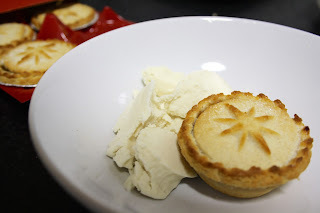 Asda's own brand mince pies are vegan-friendly, and at 89p, you really can't complain about the price! 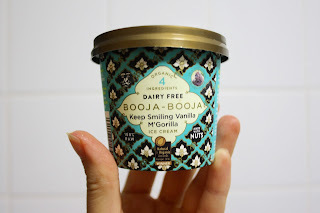 I love chowing down on my mince pies with ice cream so I picked up this mini tub of Booja Booja Keep Smiling Vanilla M'Gorilla whilst I was in Holland and Barrett. I am a huge Booja Booja fan, their chocolate flavour is TO DIE FOR and might even beat Ben and Jerry's into second place (*gasp*), but I did find this vanilla flavour a little bland. Nevertheless, the mince pies (of course I had more than one!) went down a treat and ended the meal on a high note! 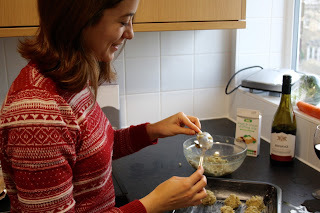 I hope this post has shown you that a vegan diet doesn't mean missing out on any of your favourite festive foods - I am over the moon to have found so many fantastic alternatives! Making the ethical choice couldn't be easier this Christmas! What are your favourite things to tuck into at Christmas? Any particular highlights from your family's Christmas dinner? Do share in the comments below! No judgement if you aren't a veggie or vegan convert, it's not possible for everyone so don't sweat it!